Hilal Elver becomes UN 'human rights expert' in 'biased' move criticized by US, while Goldstone Report co-author again misses Israel post. 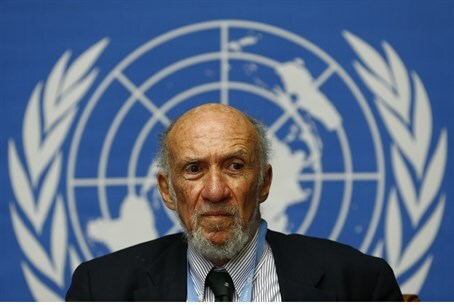 United Nations (UN) "human rights expert" on Israel Richard Falk stepped down from his post on Thursday, the same day that his wife Hilal Elver (Falk) was appointed by the UN as a human rights investigator. UN Watch condemned the "bizarre, nepotistic, and politically-driven" decision, noting that Elver's application form included self-disqualifying answers and over 20 spelling mistakes. Nevertheless, Elver has been appointed UN special rapporteur on the right to food, a position UN Watch reminds was initiated by Cuba and first held by Jean Ziegler, founder and winner of the Muammar Qaddafi Human Rights Prize named after Libya's former dictator. "Decisions like this threaten to turn the UN into a joke," said UN Watch executive director Hillel Neuer, adding that Elver co-directs a research institute on climate change and democracy with her husband Falk, who accused Israel of ethnic cleansing in March. The US administration similarly expressed its concern on Thursday, citing Elver's "lack of relevant experience" and questioning "her readiness for this assignment." Elver holds "biased and inflammatory views" against America and Israel, said the US, views that "run counter to the dispassionate professionalism central to the work of a Special Rapporteur." Canadian Foreign Minister John Baird similarly criticized the appointment, writing to UNHRC president Baudelaire Ndong Ella that Elver's "public record clearly demonstrates abysmal judgment, as well as associations with fringe groups." "Hilal Elver is not only Richard Falk's wife, employee and main collaborator, but she echoes his crude and simplistic post-colonial narrative, which demonizes America, the West, and Israel, while praising dictators like (Turkish Prime Minister Recep Tayyip) Erdogan and the books of 9/11 conspiracy theorists," said Neuer. It is worth noting that Falk's final report before leaving his post accused Israel of "apartheid." Replacing Falk in the post of UN investigator of Israel is Indonesian diplomat Makarim Wibisono. London School of Economics professor Christine Chinkin lost in a bid for the post for a second time, after being beaten by Falk in 2006. Chinkin was a co-author of the UN's Goldstone Report, which accused Israel of committing war crimes during counter-terror Operation Cast Lead in late 2008 and early 2009 , while dismissing the plethora of rocket attacks by Gazan terrorists. Speaking about the appointment, Neuer remarked "while UN Watch was the first to express concerns over several of his past UN statements made on behalf of Indonesia, I met and interacted with Ambassador Wibisono in 2005 when he was Chair of the former UN Commission on Human Rights, a position that he fulfilled with fairness and professionalism." "Despite the bias inherent in this one-sided UN mandate, which only examines Israel and presumes guilt in advance, I hope that Ambassador Wibisono will turn a new page for the UN position," concluded Neuer.